The below information will help you understand the difference between PVC and Foam Ceiling Tiles. The end goal after reading following article is for you to gain necessary knowledge to pick the correct ceiling tile for your particular situation and project. Remember that you may always call our customer service toll free at 1-866-988-4537 and ask any question that you may have. Lets start with PVC ceiling tiles. The PVC is a type of plastic widely popular in many building industries as a low-maintenance material. Besides construction, it is used for a wide array of applications within Healthcare, Sporting, Clothing/Furniture, as well as other consumer applications that include wall coverings, greenhouses, home playgrounds, toys, and let not forget Decorative PVC Ceiling Tiles. The PVC material that we used in our ceiling tiles is 20 mil thick (some finishes are 16 mil thick). The higher mil number the thicker Vinyl is being used to mold the ceiling tile. Some ceiling tiles on the market advertise plastic ceiling tiles made out of vinyl as thin as 8 mil. The thicker PVC ceiling tiles made out of 20 mil vinyl offer rigid yet still light weight product that will sit well within the drop in grid system. The PVC ceiling tiles can also be glued or stapled directly to the ceiling. They are also durable enough to be used on walls or even backsplash. The PVC material will take Water-Latex based paints very well allowing for the finish to be renewed over and over. Our PVC Ceiling Tiles are USA Made and offer unparaller quality to those produced overseas. Our PVC Ceiling Tiles are also ASTM E84 Fire Rated as Class A. ASTM E84 Certificate can be obtained here. 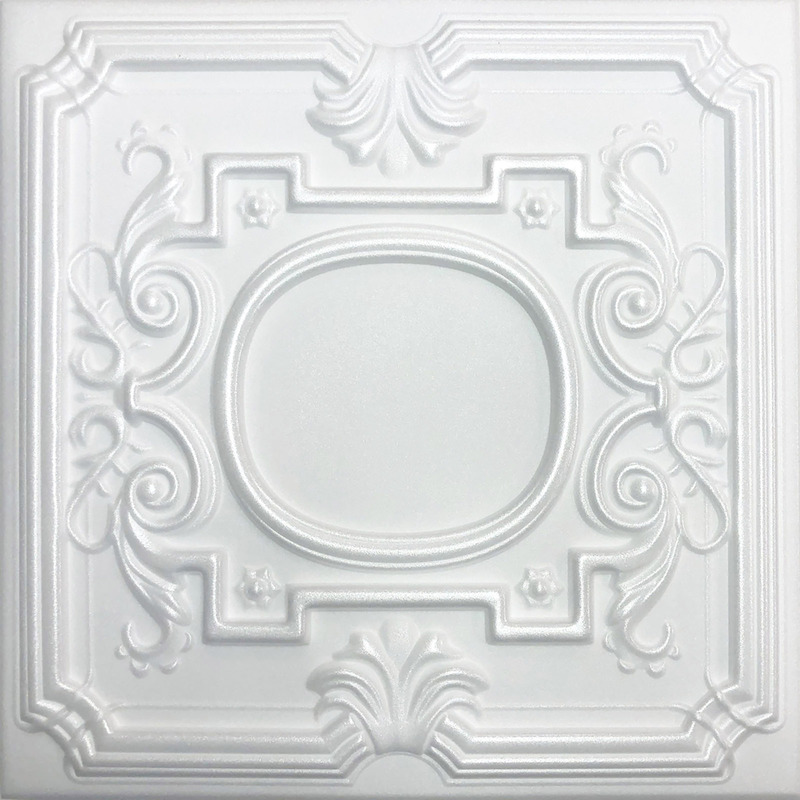 Antique Ceilings is also proud to offer Foam ceiling tiles. The foam used for these ceiling tiles is Extruded Polystyrene Foam. It can commonly be called foam or Styrofoam. Most people think of Styrofoam coolers when imagining Styrofoam. This is not the same material that is used for the foam ceiling tiles. The Extruded Polystyrene offers a very smooth surface without the visible foam beads that can be noticed in the Styrofoam coolers. The foam ceiling tiles are very light weight and soft to touch. They can be painted with most water-latex based paints. The painted product looks very authentic and even from couple feet away one cannot tell that the product is foam based. In fact many clients found that our Antique Finished as well as Metallic Finished foam ceiling tiles look as good or better than the real metal ceiling tiles. The foam ceiling tiles are very easy to cut and glue to most any surface. They can be glued directly over a stable pop corn ceiling using Acryl Pro adhesive - found at Home Depot store. For a glue-up application the foam ceiling tile is a recommended product to be used. It is, however, soft to touch and does not offer the toughness of the PVC material and for that reason we only recommend using it on ceilings. We do not recommend using foam ceiling tiles for walls or backsplash as hard objects, such as silverware, floor broom-stick, etc. will damage the soft foam surface. Our foam ceiling tiles are produced with highest quality in mind only in European Union (EU) factories. There are other companies selling similar foam ceiling tiles produced in China, however, difference of quality of the material as well as the design can be quickly noticed.